Corie (the ebullient Caitlin Wise) sees only bright-colored possibilities in their small, cold apartment. Paul (a steady and bewildered Dustin Bronson) sees the reality. Paul technically adds the front stoop to the five flights of stairs they must climb every day. How many flights becomes a running joke. It’s comedy gold in Simon’s bag of tropes. Every top-of-the-stairs entrance evokes a different dilemma. A telephone repairman (the droll Antony Terrell) barely makes it and dreads a return. Corie’s mother (the inimitable Christy Brandt) breathlessly collapses and later has to be carried in. Victor Velasco, a mooching neighbor (the engaging Logan Ernstthal), enters and exits in a different manner with different comedic consequences. It’s such a pleasure to see well-crafted three-act play where the human condition is explored with wit and charm. Simon’s pingpong rhythms, as Ben Brantley has written in the New York Times, play naturally under Perlman’s direction. And the big Corie-Paul argument scene is powerfully performed. It travels and merges the lanes of love, anger and even cruelty. Wise and Bronson’s performance also lifts Simon’s view of marriage into a higher realm of conflict. “Barefoot” closes Aug. 9. Don’t miss it. “The Wizard of Oz” runs through Aug. 26. It’s an adaptation of the 1939 MGM film of the American classic by Frank Baum. 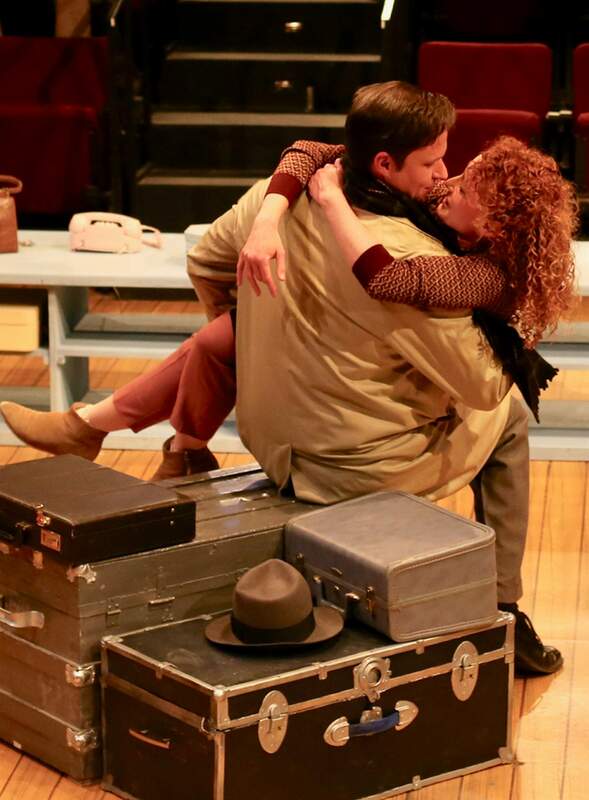 Directed by Emily Van Fleet, the CRT production unspools swiftly with terrific stagecraft. Photo projections of clouds turn Kansas skies into Munchkin Land, Oz, the dark forest and back to Kansas. An onstage band is barely visible as it sits under a catwalk where props and puppets fly through the storm and where Miss Gulch (a smarmy Anne Faith Butler) later rides by as the Wicked Witch. 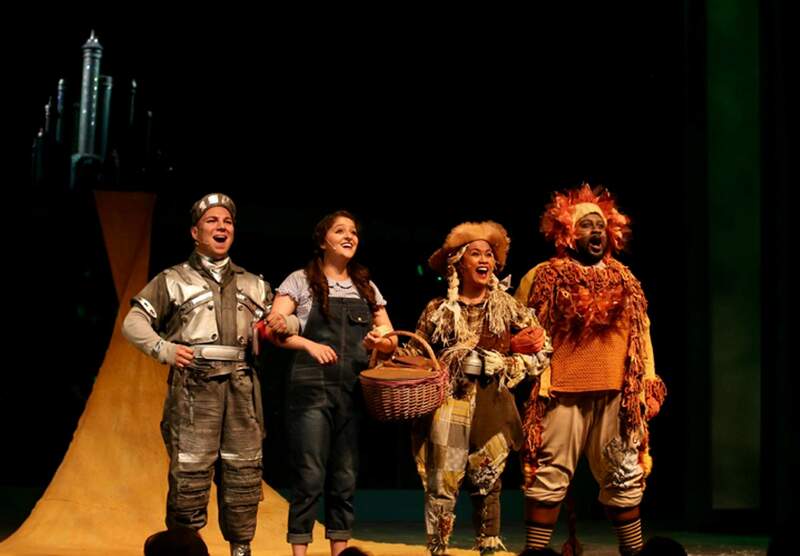 Dorothy Gale (a wonderfully incredulous Yael Chanukov) embarks for Oz with her road companions: Scarecrow (a spritely Regina Fernandez), Tinman (a lithe, Spanish-speaking Claudio Venancio), and Lion (a joyfully burly Antony Terrell). Throughout, an ensemble of four dancer-actors, perform cartloads of functions. They play the Munchkins, the guards and the flying monkeys. They, plus Zayaz Da Camara, who is a splendidly fey Oz Guard, as well as stolid Uncle Henry, do most of the heavy lifting for scene changes. You quickly realize you’re not in Kansas anymore, but you always know where you are thanks to set designer Robert Mark Morgan. Asa Benally’s puppets and overall costume designs expand the universe even further. Light and sound designers Matthew Schlief and Dustin Lacy enhance the Kansas/Oz illusions. And Music Director Ian LeRoy’s crack stage band sounds like a sixteen-piece orchestra when the reality is four talented musicians. Between now and mid-September, you can also enjoy previews, chat backs, jazz and story nights, art exhibits, a 10-minute play festival and other special events like the Aug. 21 comedy roast of company stalwarts Christy Brandt and Brownie. She’s the CRT matriarch who has played everything from Destry to her double role as Professor Marvel and the Wizard of Oz this summer. Brownie is the company photographer, and both have grounded CRT for the last 44 years. For more than five decades, CRT has been presenting compelling dramas, smart comedies and American musicals in Colorado’s high country. From Durango, it’s a beautiful 2½hour drive over Wolf Creek Pass and the Continental Divide. WHERE: 124 N. Main St. Creede, a 2½-hour drive west on U.S. Highway 160. TICKETS: Ranging from $10 to $40. Call (719) 658-2540. MORE INFORMATION: For the season schedule, visit www.creederep.org.